P.M.H. Atwater, L.H.D. is looking for people who feel very different or odd because of pre-birth memory, birth trauma, being a preemie, or while a baby, toddler, up to the age of five. P.M.H. seeks to refocus on tiny ones, to double-check the work she has already done. Our tiniest near-death experiencers are different. Her earlier work in this area is contained in the book The New Children and Near-Death Experiences. Please complete the following items listed here or download the list in this file. Donate to Book Translation Project! 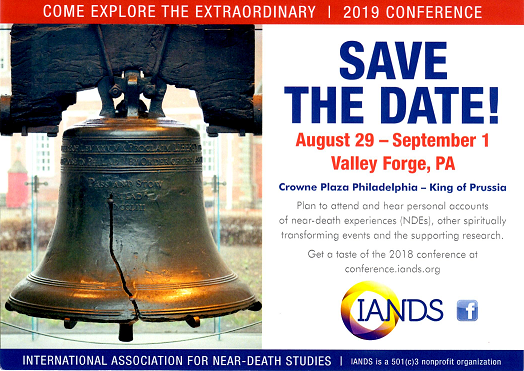 IANDS is bringing an important NDE research book to English-speaking audiences. The project involves translating and publishing the recent Dutch book by NDE researchers Titus Rivas, Anny Dirven and Rudolf Smit that details 78 cases of veridical perceptions and other verified paranormal aspects of NDEs. Veridical perceptions in NDEs provide the best evidence of the apparent separation of consciousness from the physical body and, by implication, survival of consciousness after death. We need to raise $17,500 in total for the project to publish the book. IANDS has allocated $4,500 to the project. NetwerkNDE (the IANDS affiliate in Netherlands) plus a number of other donors have brought the total donations as of April 2016 to $17,500! That means we have now reached our original goal! The translation work is done and editing is well under way. There will be over 100 cases in this edition and we expect the book to be published by July 2016. We still need your help -- to promote the book. Please consider a donation to this important project! Donate here! Book synopsis! Researchers from the University of Liège (Belgium) teamed up with researchers from IANDS France and IANDS Flanders to compare near-death experiences (NDEs) occurring in coma versus non-life-threatening events. IANDS provided conceptual input and helped locate NDErs to participate. The study, reported recently in the press (also here), compared 140 NDEs from people who were in coma against 50 NDEs from people who were in non-life-threatening situations (sleep, fainting, meditation, drug or alcohol use, etc.). The study of NDEs took a significant turn with Nancy Evans Bush's important work, Dancing Past the Dark: Distressing Near Death Experiences. In a recent series of posts, Peter Hulme reviews this book in detail and provides an excellent summary of some of the important components of this book. As Hulme states, "...of the 354 near-death experiences ... between the years 1975 and 2005 ... there were no unpleasant reports." Dancing Past the Dark introduced the topic of distressing NDEs with an insightful discussion of the components of these experiences, methods for interpreting them, and ways to help people to integrate the experiences and move on with their lives. In his first posting, Hulme provides an introduction to distressing NDEs and discusses why it is important to study these experiences. Dr. Gregory Shushan of Oxford University "...examines the relationship between afterlife conceptions and conceptually-related anomalous experiences in ethnohistoric indigenous traditions worldwide." In 2012 he gave a lecture at the Ian Ramsey Centre for Science and Religion which compared the components of NDEs to the religious texts of numerous ancient civilizations. His work convincingly shows that NDEs have inspired afterlife conceptions among world cultures from ancient times. That is, NDEs appear to be a causal inspiration of religious belief from ancient times, not an illusion produced as the result of religious belief. He is also the author of the book Conceptions of the Afterlife in Ancient Civilizations. Dr. Shushan's full lecture can be seen online at this location. NDE researcher Robert Mays moderated a symposium on near-death experiences in November 2013 called A Journey to Heaven and Back. The symposium was jointly sponsored by IANDS and the Open Center in New York City. The program featured NDErs Dr. Eben Alexander, Anita Moorjani and Lorna Byrne. If you have had, or think you might have had, a near-death experience (NDE): You are invited to participate in a research study examining whether or not you experienced being visited by a deceased person who communicated a message they wanted you to convey to another living person (termed spontaneous mediumship experiences, SMEs), prior to and/or after your NDE, and if so, the nature of those experiences. The research is being conducted by Ryan Foster, Ph.D. and Jan Holden, Ed.D., editor of the Journal of Near-Death Studies. Participation involves completing an online survey that should take you about 30 minutes. If you had, or may have had, an NDE; if you’re at least 18 years old; if you’re at least reasonably fluent in written English; and if you’re willing to participate in the study, please click here to take the survey. For more information, email Dr. Foster: rfoster(at)marymount.edu. A recent study by Jimo Borjigin and colleagues (University of Michigan) reports that highly coherent, global oscillations in the brains of rats occurred from about 12 to 30 seconds after cardiac arrest. The investigators found that near death, some of the electrical signatures of consciousness exceeded levels found in the waking state, providing "strong evidence for the potential of heightened cognitive processing in the near-death state." "The measureable conscious activity is much, much higher after the heart stops." They assert that this evidence provides "a scientific framework to begin to explain the highly lucid and realer-than-real mental experiences reported by near-death survivors." How well do these assertions hold up to scrutiny? The Big Book of NDEs is back! The Big Book of Near-Death Experiences: The ultimate guide to what happens when we die by P.M.H. Atwater is back! This is a wonderful, comprehensive encyclopedic resource full of useful information about NDEs and related phenomena. The Big Book is now available on-line from P.M.H. Atwater and from IANDS' Shopping Cart. IANDS is now offering a discount for The Big Book to IANDS members. We also have The Handbook of Near-Death Experiences: Thirty Years of Investigation on the Shopping Cart, also with an IANDS member discount.